St. Mary's Ministry Fair will be held on Sunday, September 20 after the 7:30 a.m., 9:00 a.m. and 11:00 a.m. Masses. The Ministry Fair is an event in which all St. Mary's ministries, organizations and groups are showcased at one time. It's a great opportunity for our parishioners and any visitors to meet people and gather information about St. Mary's and the various ministries and endless opportunities to become involved in our faith community. 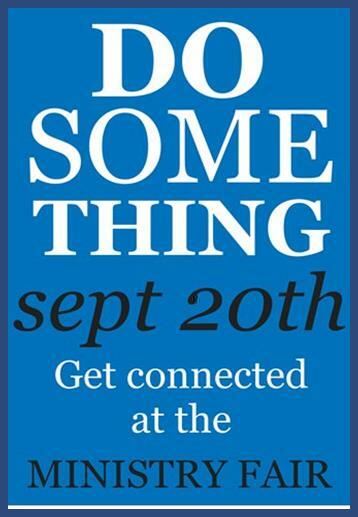 Learn more about how you can get move involved at St. Mary's. St. Mary's Visitation Parish Picnic will be held on Sunday, September 20th from noon-2:00 pm. Help us welcome our guests of honor, our new school and parish families as well as our new staff members. There will be food and games and crafts for the kids. This event is generously sponsored by the St. Mary's Visitation Home and School in appreciation to the parish for their support.